My Cat Brought Fleas In – And Now They’re Nesting In My Carpet! 1​Vacuum your carpet thoroughly. Use the nozzle attachment instead of just pushing the vacuum cleaner. Start at one end of the room, and vacuum in strips until you have covered the entire carpet. Pay special attention to the corners of the room and baseboards. Fleas like to hide in dark and humid areas, so vacuum underneath furniture well. • Be sure to focus on areas that your pet likes to spend time in, as well as around baseboards, near entryways, and under furniture. 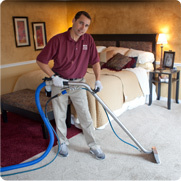 • For very heavy infestations, continue vacuuming every day for 10 to 14 days. 2​Vacuum any upholstered furniture in the room. Make sure to get the base and the underside. Fleas often jump onto the furniture, and they could re-infest your carpet if not removed. 3​Throw away the vacuum cleaner bag. Don’t throw it away inside your house. Instead, take the bag out of the vacuum cleaner, put it in a plastic bag, tie the bag up, and throw it away outside your house. This will prevent any remaining fleas form getting back inside your home and back onto your carpet. • If your vacuum cleaner uses a canister instead of a bag, take out the canister and empty the debris into a plastic bag. Tie the plastic bag up tightly and throw it away outside. 4​Consider steam cleaning your carpets and furniture. If you don’t own a steam cleaner, rent one from a home improvement or grocery store. Follow the instructions that come with the equipment carefully. The high temperature exerted from the steam cleaner will kill both adults and eggs.